Although holiday shopping season does not start until almost 6 months from now, we have decided to look back at Black Friday statistics from the recent years. In this post we will concentrate on sales trends on Black Friday and the shopping events around it, how Black Friday shopping evolves in Europe, and in the upcoming months we will come back with a few more articles on marketing strategies for Black Friday sales, will touch on logistics and customer loyalty aspects. By October these materials and more fascinating information will be compiled into an ebook. We invite you to join us, read and learn about these trends, comment and make your suggestions to this series of publications. When you think about pre-Christmas shopping season two days stand out immediately: Black Friday and Cyber Monday. Black Friday is the beginning of the holiday shopping season that lasts up until the Christmas Day and is responsible for 30% of annual retail sales, making it a crucial day for retailers. Road traffic might have been bad on Black Fridays in previous years and decades, but with every year now we see steady growth of eCommerce sector in Black Friday sales, drawing shoppers away from shopping malls. Cyber Monday is a term coined in 2005 reflecting a spike of sales on Mondays following Thanksgiving caused by people returning to work and using their offices’ high speed Internet connection to shop. The reason is no longer valid since most Americans and Europeans have broadband at their homes, however Cyber Monday is still used by retailers as a discount event, and it is consistently a very successful sales day. Since 1930-ies retailers have been trying to make the holiday season last longer to get more revenue, at one point even convincing President Roosevelt to move Thanksgiving one week earlier. Over the past decades more and more stores have adopted the policy of opening in the evening on Thanksgiving Day instead of at midnight the next day, all in an attempt by retailers to win over consumers earlier so that they are more likely to come back later in the holiday shopping season. The trend has led us to a situation when many stores start sales before Thanksgiving dinner has even begun. According to Adobe which has been tracking nearly 4,500 sites, including 80% of the top 100 retailers, in 2015 Thanksgiving offered consumers the best deals, with products being discounted by an average of 26% (compared to a 25% average price drop on Black Friday and 21,5% on Cyber Monday). Black Friday still remains the bigger sales day, but Thanksgiving sales share has been growing steadily during the past decade. Some of the market experts forecasted Cyber Monday’s importance as a shopping event would be decreasing, but in 2015 sales on Cyber Monday have exceeded $3 billion making it the biggest eCommerce day ever showing 16% growth from the previous year. Just as it happened with daily shopping, online shopping on holidays has been winning hearts of consumers over the years. But does the trend show any signs of abating? Brick and mortar revenues on Black Friday dropped by $1 billion in 2015 bringing $10.4 billion to retailers. At the same time, according to Adobe, online sales increased by 14% reaching $2.74 billion on Black Friday and $1.73 billion on Thanksgiving. According to the annual survey commissioned by the National Retail Federation, 2015 was the year when popularity of online beat offline holiday shopping. More than 103 million people shopped online over the Black Friday 2015 weekend, whereas less than 102 million people made a purchase in traditional stores. Apparently the trend stays strong: web stores attract more and more people, and shopping malls might decide to reduce their parking spaces in not too distant future. Mobile sales continued to increase in 2015, although have not yet leveled with desktop. The Big Blue estimated mobile at 57.2% of all Thanksgiving traffic and 36.2% of all sales. 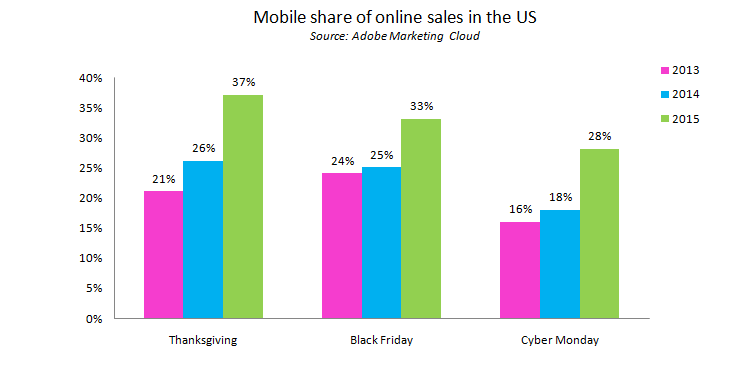 Adobe estimate was 37% of Thanksgiving, 33% of Black Friday and 28% (or $799 million) of Cyber Monday online sales. It is hard to overestimate mobile sales during this holiday season. 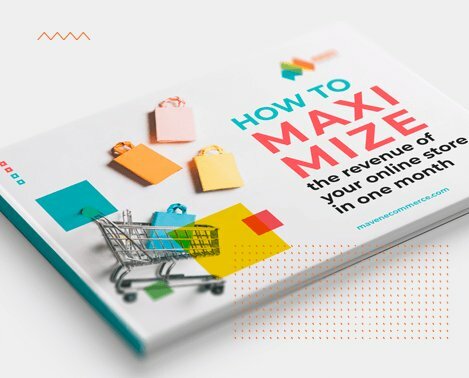 That proves what has been known all along: if you want to keep your business steady and growing, make sure your mobile website provides shoppers with great experience. Tablet share of online sales predictably continued to decline this year, with tablets making up 15% of online sales on Thanksgiving, 13% on Black Friday, and 11% on Cyber Monday. IBM estimated the average order value (AOV) on Black Friday 2015 at $127.84, which is a slight decrease from 2014, when estimated AOV constituted $129.37. AOV from tablet sales was estimated $136.42, so for the first time it beat out AOV (which constituted $134.06) from desktops. According to Adobe Digital Index, the average order value constituted $162, an increase by 9% from the previous year. Although in Europe Black Friday is still regarded an American phenomenon, there have been attempts to make it a big shopping event in UK, Germany, France and Italy. Wallmart-owned ASDA retail network has been the frontrunner in the UK, announcing huge discounts on Black Friday in 2013 and 2014. Their effort along with the deals announced by some other companies including Amazon has brought admirable results in 2015. But when the hype was already there last year, ASDA suddenly decided to withdraw, and its competitors Tesco and Curry had their shelves emptied over the weekend. UK sales during the Black Friday Cyber Monday weekend in 2015 surged and reached the record £3.2 billion. This considerable growth has even affected Christmas sales, thus changing sales dynamics within the holiday season. It is predicted that in the upcoming years the discounts weekend will be spreading towards the four-week holiday discount season lasting up to Christmas Day. It is fair to say that Black Friday event did not generate more revenue overall (according to Retail Times, the year-on-year sales during the festive period had been growing steadily and in 2015 constituted 2.1% more than in 2014) but certainly allows proactive retailers start holiday discount season earlier and possibly win a bigger share of the market. Amazon’s UK subsidiary reported its biggest sales day ever with 7.4 million items sold on Friday alone. Just as in the United States, Black Friday 2015 in the UK demonstrated online shopping winning over offline, leaving shopping malls with empty parking lots. Internet sales surpassed £1 billion in one day for the first time in UK history, £810 of which were received through online sales, an index, which increased by 36% year-on-year. A number of online retailers that announced discounts struggled to keep their websites up and running on Black Friday, as the number of users were logging in to get the best deals increased dramatically. At lunchtime John Lewis’ website was down for an hour. On a day when around £90,000 is spent online per minute, this must have been a very expensive downtime. Still this became the best sales day, followed by the most successful sales week for John Lewis in its 151-year history. Other websites incurring technical problems due to high demand were Argos, Tesco (whose page load time for a period slowed down to 8.4 seconds), Boots, River Island, Next, Debenhams etc. The rest of Europe is not quite as active shopping during Black Friday, although more and more stores are willing to offer their discounts and a lot of shoppers expect retailers to provide bargains on these days in countries like Germany and France, as they get more aware of the American shopping culture. According to MotionPoint, French customers are known for their interest in discounts were surfing the Internet in search of the best deals on Black Friday, and bounced from the websites that did not try to offer them good deals. However, France was a special case when it comes to Black Friday shopping activity in 2015, as the day followed the November 13, a Friday when terrorist attacks in Paris took place, which forced retailers to rename their campaigns due to negative connotation of the word “black”. And although in line with the global trend, French eCommerce market saw a surge to 64,9 billion euros in annual income in 2015, which is 14% higher than 2014, conversion has dropped dramatically in the weeks following the Paris attacks. Still, conversion rate increased from 2.4% to 2.6% on Black Friday and sales were expected to reach $240 million. The trend, though, stay strong, and the value of Black Friday becomes more substantial for retailers in the European market, therefore competition is expected to grow in the upcoming years. French market would normally show a bigger growth, as Germans are generally more conservative shoppers, less impressed by discounts and not completely trusting online security. Yet Germans were estimated to have spent €924 million online (over $1 billion) on Black Friday and Cyber Monday in 2015. As large as this sum may seem, it constitutes less than 2% of the impressive €85 billion Germans spend during the Christmas shopping season in November and December every year. The interesting part is that in the perception of Europeans, Cyber Monday is hardly distinguishable from Black Friday and is perceived as a part of the same event. Since 2014, when Black Friday was first introduced in South Africa, retailers have been doing their best to make it an outstanding shopping event. Food retailer Checkers was the company that brought Black Friday to the country and in 2015 it teamed up with taxi app Uber to offer customers a free ride to and from its supermarkets, ensuring every customer has the opportunity to shop. Black Friday does make a global impact, and we look forward to the sales figures from 2016 holiday shopping season as we are curious to see how these trends change, and how markets adapt.